The Natural History Museum of Los Angeles County just had its 32nd annual Bug Fair. Of course, I had to go and what better than to share the experience with you? After multiple posts about bugs, you may wonder if I’ve anything new to say. There’s always something new to learn at a museum! 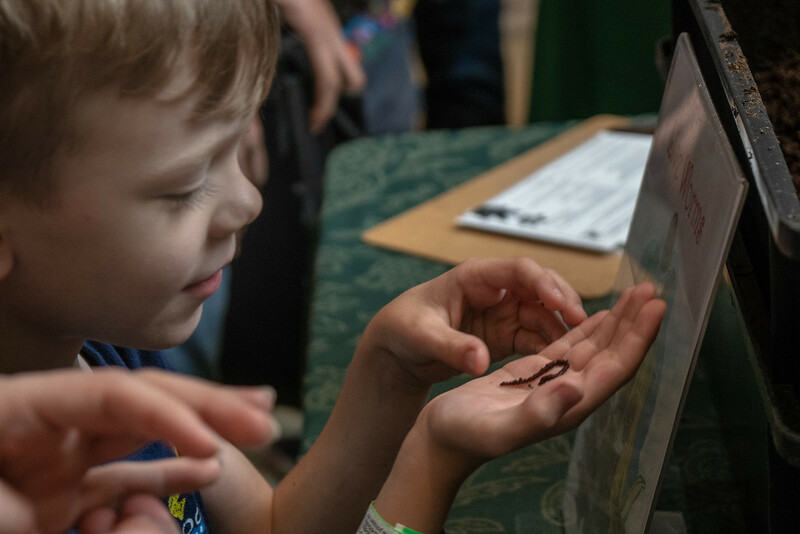 Along with all the fun stuff like face painting and butterfly nets, the bug fair also has a serious side that attempts to educate the populace to the not-so-attractive side of bugs. 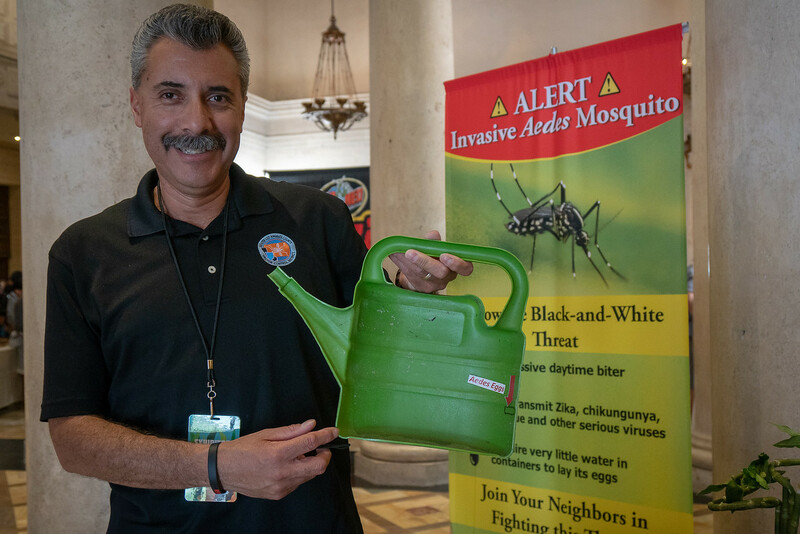 The Department of Public Health was on hand to warn visitors about Zika virus. Tiny eggs are at the bottom of this green pail. This flu-like virus is carried by Aedes mosquitos. Well, many things are caused by flying insects, right? What’s so special about these mosquitos? The infinitesimal eggs are viable for ten years! They can sit in that dry container for a decade waiting for a bit of water. Once wet they will hatch! The water required by the mosquito is about a tablespoonful. The man above had a bottle cap from a plastic water bottle. That cap would be enough water for a female mosquito and her eggs. I don’t have bottle caps sitting around my yard, but I do have potted plants with a saucer under each. Those saucers catch and hold water for my plants. They also hold water for mosquitos. Try adding sand to the saucers. I seldom give much thought to bugs, and certainly none to sea worms. I never even heard of Polychaetes and suspect that many other visitors felt much as I did. They crowded around the table for a close look through a magnifying glass. 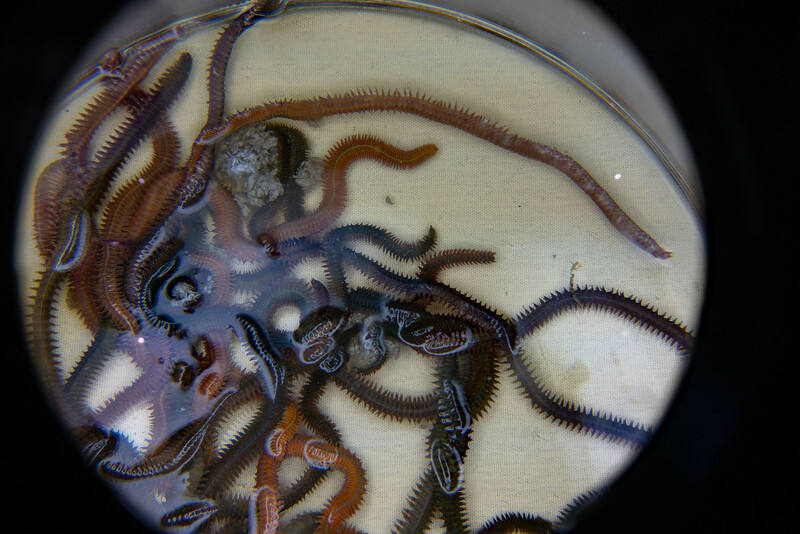 Polychaetes as seen through a magnifier. These animals have been around for millions of years. They survived all five of the Mass Extinctions! That’s impressive. There are over 10,000 species of polychaetes. Some live in freezing water while others prefer a much hotter environment. Such a diverse animal! It’s always exciting to discover something new about one’s world. Perhaps acknowledging the polychaete helps to lessen human hubris as well. One of my greatest pleasures at the museum is watching the children experience bugs. They don’t have the phobias that adults have. Children are curious. Los Angeles County had a booth about gardening and composting. I stopped to listen, and photograph. The poor worm was probably wondering where it was. The boy was fascinated by the thing. He explained it all to me. I love moments like this. I think of them as innocent and quiet joy. It’s what the bug fair is all about. This boy may grow up to be a great entomologist one day! The Bug Fair is over for this year but will come around again next May. It’s a two-day weekend event featuring commercial booths, games and entertainments for children, and bug-related cooking demonstrations. You can buy a Venus fly trap or a tarantula. The choice is yours. I prefer to buy a book or piece of jewelry. It’s lots of fun for kids, especially the outings in the museum gardens. The Natural History Museum is located in Exposition Park, the site of several museums and sports arenas. It can be crowded so plan accordingly. The Los Angeles light rail system stops at Exposition Park. I think it’s a good way to travel. To see a few more pictures from this year’s fair, just click here. Traveler, explorer, memory maker and someone who's just downright curious about stuff. It's all about finding joy.